"Getting Your Items Online Is Difficult"
Brain surgery is difficult. Flying people to Mars is difficult. Getting your products online is not difficult. There are many so called eCommerce experts out there who want you to believe that you can't get your products online unless you pay them first. Here's a newsflash - it's not 1997 anymore. The "technical" part of the equation has been greatly simplified and should, in most cases, be accessible to you and your organization. Want to get onto Amazon? With just $39 and a weekend, you too can be a seller on Amazon's Marketplace. Would you also like a direct-to-consumer (DTC) web store? Shopify's got you covered. You don't need to know a lick of HTML - you can be online with a beautiful theme for less than $200 and fulfilling your first sales within a couple of days. Walmart.com can be a little bit more complicated but it doesn't have to be - there are great integrations out there that will even allow you to manage Walmart and fulfill orders directly from your DTC store dashboard. The same is true with several of the other major retailers. "Once You're Up, Money Will Just Roll In"
To get all of this to happen, you need more than an eCommerce expert... you need an eCommerce team. For many organizations, especially larger ones, it's smart to have some of this capability in-house. Even so, you'll likely want some outside help especially on your eCommerce marketing - an area of constant change. If you do decide to get help, here are some suggestions for selecting the best eCommerce partner for your needs. "It's All About the Content"
What if you planned a great party, ordered all the supplies, and got your home ready for the big day but then realized that you'd forgotten just one important thing... the invitations? As you sat there munching expensive hors d'oeuvres and listening to your favorite playlist all by your self, you might have a hard time qualifying the event as a success. Great eCommerce content is like that... it's fun but isn't worth all the effort unless you invite people to the party. Once your content is built, you'll also need reviews so that you can establish credibility. That's why the best kind of eCommerce party is a housewarming party. Make sure you have a plan to get traffic to your listings as soon as your content is live. If you're focused on Amazon, make sure you learn the ins and outs of Amazon PPC. If you want traffic for your own site, consider Facebook, Instagram, and Google along with affiliate and influencer programs. Watch conversion rates closely, by source if possible, so that you can turn off non-performing traffic. On some marketplaces, including Amazon's, a burst of high-conversion traffic will move you up in the rankings for relevant keywords. This will lead to additional organic traffic improving your ROI. "You're a Big Brand... You Can't Lose"
eCommerce is a great equalizer between established big brands and smaller upstarts. We conduct quantitative analyses on over 100 categories per year and consistently find companies that are virtual unknowns at physical retail outperforming the big national brands. 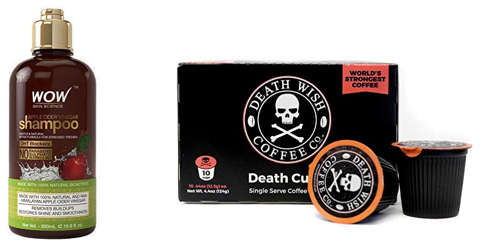 Among our favorite examples are Death Wish and Wow! Products, currently the Amazon best sellers in Coffee and Hair respectively. So why are smaller brands winning online? The first and most important reason is that the traditional barriers that kept them out of physical retail don't apply online. At your local Kroger, brands have to fight for very limited shelf space but that constraint doesn't exist on Amazon where, as previously noted, anyone can get "on the virtual shelf" in no time. It's not just that, though - the best small brands are also aggressive eCommerce marketers in a way that most larger companies just haven't figured out yet. They move fast, measure everything, and optimize often. "More SKUs = More Sales"
If you have a large portfolio that you'd like to accelerate, consider taking a phased approach - start with the items that have the best eCommerce potential, get them moving, and then launch additional waves. With each wave, you'll gain learning that will help you to become more efficient in the next. You're looking for eCommerce help and we want to provide it to you. You have lots of choices and we understand that it's really difficult to figure out which one is right for you. We've been there - before becoming consultants, our leaders spent decades as eCommerce clients at Fortune 50 companies. We're convinced that we've built a better way and want to show you why. How about 20 minutes to discuss how we can help you grow your business?